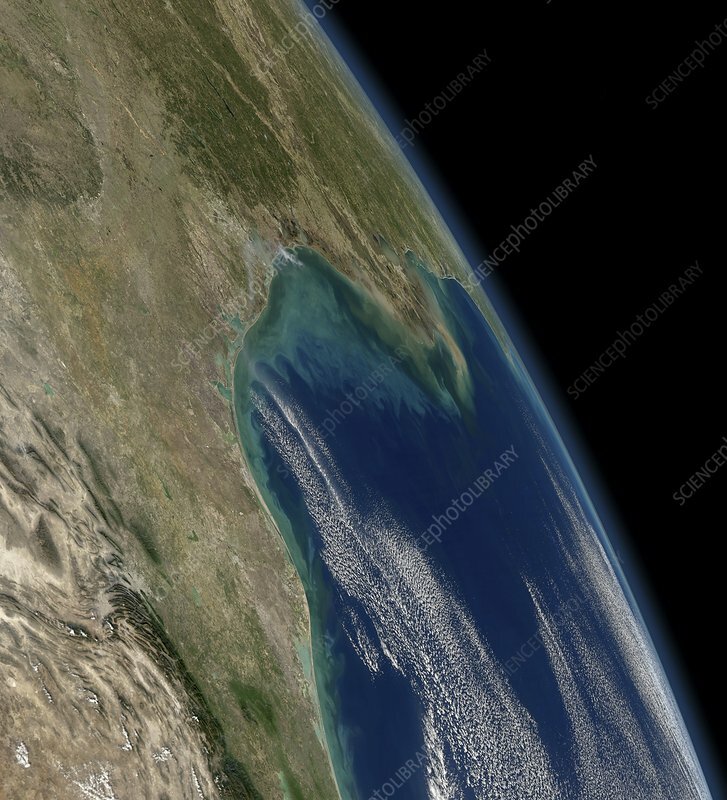 Gulf of Mexico coast, satellite image. North is towards upper left. Clouds are white. The Mississippi River, flowing south, enters the Gulf of Mexico at New Orleans, Louisiana, USA, at upper centre. This river annually discharges 500 million tons of sediment into the Gulf, producing these swirling colours. This coastline stretches for over a thousand kilometres from the Texas and Mexico (lower left), eastwards to Florida (horizon, centre right). Image data obtained on 3 January 2012, by the Moderate-resolution Imaging Spectroradiometer (MODIS) instrument on NASA's Aqua satellite, part of the Earth Observing System (EOS).